ForceField has been through every security test in the book – and passed them all with flying colours. The Australian Standards test consists of six separate tests that all have to be passed by the same test sample...so it adds up to quite severe punishment. Have a look at the results below – presented in the sequence in which the tests were carried out. Passed. 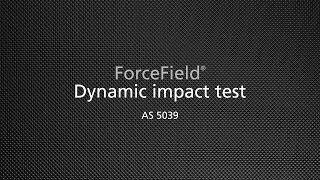 The dynamic impact test is not much of a challenge for a ForceField® security door or window. During cyclone testing ForceField® has survived more than 16 times the force. You will always feel secure behind a ForceField® security screen. It passes the Australian Standard for dynamic impact with ease – it has withstood forces that no human could apply. Passed. 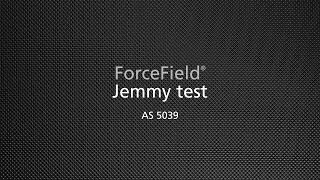 The dynamic impact test left no gap to insert the screw-driver, so the jemmy test couldn’t even be performed on the ForceField® security window! All ForceField® security doors passed the test easily – all locking and hinging points were secure after the test. Even armed with a large screwdriver or similar, potential intruders won’t get past a ForceField® security door or window. Imagine an intruder trying to pull out your security screen…that’s what the pull test is all about. The security door or window must be able to withstand pulling forces of up to 2 kN (200 kg) for 20 seconds at various positions. Passed. The mesh in a ForceField® security screen is so fine that there is nothing to grab. Even after the dynamic impact test and the jemmy test, there is no gap between mesh and frame on the ForceField® security doors and windows either. The test lab has nowhere to pull so the test is over before it begins. Good luck with trying to pull out a ForceField® security door or window. If the test lab can’t find anywhere to pull, a potential intruder has no hope. Passed. This test simply can't be performed on a ForceField® security door or window because the aperture in the mesh is less than 2 mm x 2 mm, far less than the test requirement of a 213 mm diameter probe. The mesh in ForceField® security doors and windows won’t allow an intruder to get his hand inside to unlock a door or a window. Passed. To pass this Australian Standards test, continuous penetration of less than 150 mm is required. The knife shear test hardly leaves a scratch in a ForceField® security door or window. Even a strong burglar with a heavy duty trimming knife and 3 fresh blades won’t stand a chance of getting past a ForceField® security door or window. Passed. The test simply can’t be performed on a ForceField® security door or window because the mesh is too tightly woven for the pliers to get a hold. But – for the record – the average breaking point of a strand exceeds the standard by more than 60%. A potential intruder armed with cutting pliers will be disappointed with your choice of security screen. There’s no way the pliers will get a hold.